Dolomite’s Micro Droplet System operates over a wide flow range, from 0.1µl/min to 10 ml/min. Dolomite’s Micro Droplet System operates over a wide flow range, from 0.1µl/min to 10 ml/min. This chemically resistant system is designed for initial concept work and experimentation towards the development of high throughput droplet systems. The Syringe-based Droplet Starter System includes a range of Droplet Junction Chips with different geometries, channel sizes and surface properties, which enable the formation of both water-in-oil and oil-in-water droplets. This easy-to-use system is the latest addition to Dolomite’s Micro Droplet System range and comprises of two independent syringes, with rotary valves, enabling fast automatic refill from up to three different sources, as well as an independent control of each liquid channel. 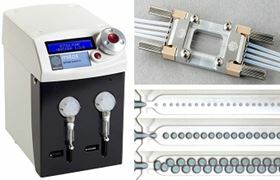 As a modular system, the pump and droplet generation components are quick and simple to connect, ensuring that reliable and accurate data is obtained within a short time-span.